Valiant Entertainment is home to some of the greatest heroes on the four-color page- X-O Manowar, Bloodshot, Ninjak, and… Quantum & Woody. The heroes bound by bracelets that must be “Klanged” together every 24 hours, or the two disintegrate. With the latest series, which is collected in this volume, we see the relationship of the two put to the test when a secret from their past comes back to haunt them. From Daniel Kibblesmith, Kano, and Dave Sharpe, this five-issue collection gives us a look into the childhood of Woody and his step- brother Eric, also known as Quantum. It turns out, Eric has been keeping a secret from Woody, that being that Woody’s father is still alive. This tears the team apart, sending Woody on a bender and in league with villains working for “the smartest person alive”, someone that can remove the bracelets from the two for good. In these 5 issues, we get to see Woody come face to face with the Negative One, Thedge the Hedge, Kid Tesla, and we see the famous goat give birth to a very unexpected result. We also see how Eric’s father influenced both Eric and Woody from childhood and helped them become who they are today. We also get to see Woody’s father and see the duo cause all kinds of mayhem. 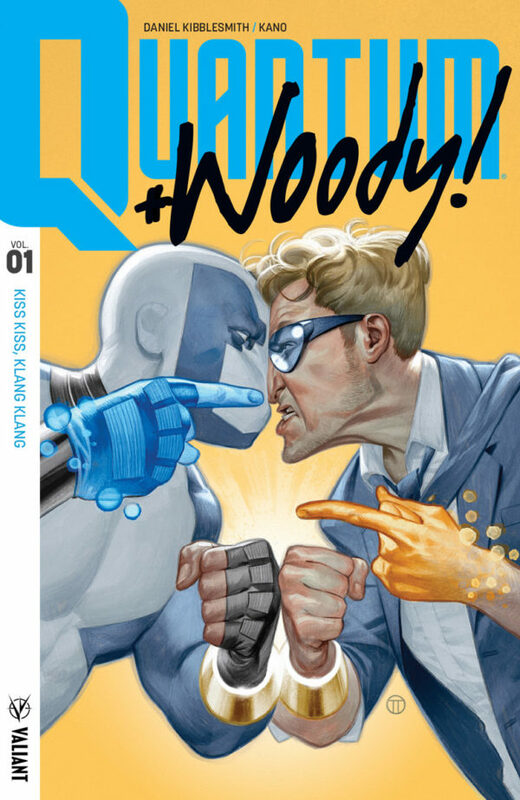 Kibblesmith creates an entertaining, amusing tale, one that is steeped in Quantum and Woody’s history, yet is accessible to new readers as well. Kano’s artwork is a great fit for the superhero hijinks the two are known for and creates some very cool panel and page layouts. The last issue of this collection is so unique, I don’t believe I have seen something like it before. I recommend picking up this collection when it drops this summer. Valiant is poised to become a household name soon, and you better believe Quantum & Woody are among their pantheon.